Over the last 4-5 years of our Age-Well Project we’ve tried hard to uncover longevity sweet spots, by which I mean the right balance or the perfect quantity of something. We’ve always considered a balance of protein, carbs and vegetables/fruit as the optimal way of eating. So we were thrilled with the big study that appeared over the summer hailing the balanced diet: protein, carbs and lots of vegetables. Goodbye low carb diets, high fat diets, low fat diets, high protein diets, cabbage soup diets – and so on! Our bodies are built for balance and moderation according to Professor Roberta Anding, whose course on nutrition I’m currently half-way through. It’s a point she makes repeatedly, urging us all to return to a more old-fashioned way of eating. And it’s not just the food. It turns out that almost everything has a sweet spot. Even booze. Back in June I wrote about the alcohol sweet spot – the amount we need to consume for a glass of wine or beer to be protective rather than damaging. Since then, a huge meta-analysis has been published in the Brain journal confirming that both being teetotal and drinking more than 14 units a week (that’s a maximum of 7 medium glasses of wine per week) are associated with dementia. Even after stripping out factors that might skew the data, a little alcohol was found to protect the brain. So, for brain (and heart) health the alcohol sweet spot is somewhere between 1 and 7 glasses a week. It’s thought to be less for cancer. So I’ve devised my own sweet spot (more of a quota really) of 4-5 glasses a week, which gives me a little leeway if I fancy it. It’s a lot less than I used to drink but I’m perfectly happy with it. We’re all different so your own quota might be lower or you might opt for the full seven glasses. Research over the summer also reaffirmed the role of coffee in longevity: several cups a day appear to be protective, anything from decaff to instant to espressos, suggesting it’s not the caffeine but a micronutrient in the coffee bean. This report claimed up to eight cups a day was fine, but previous studies suggest a sweet spot of 3-4 cups a day. Again, I’ve set my own sweet spot based on personal physiological reaction and a desire to leave some drinking room for other goodies like green tea. Exercise also has a sweet spot. When I read, over the summer, of the early death of Scottish ultra-runner, Donald Ritchie, I was saddened but not surprised. He died at 73 suffering from diabetes, heart and lung problems. He should have been hugely fit and healthy – all that exercise, all that fresh air. Richie began running, then became a marathon runner, then an ultra-distance runner, often running 150 miles a week. One of his world records included a 100-mile run in 11 hours and 51 minutes. This is too much exercise – even for the fittest, best trained individual in the world. Richie was way over the sweet spot! In her study of telomeres (the caps that sit on the end of our cells like the plastic tips of shoelaces protecting our cells from, and now considered a bio-marker of ageing), scientist Elizabeth Blackburn explains that too much exercise shortens our telomeres, making it almost as bad as too little exercise. Another report I’ve come across (although it’s not yet published) shows that doing more than 30-40 minutes of very vigorous exercise in one go actually does more harm than good. For sleep the sweet spot is thought to be between 7 and 8 hours: the summer also saw headlines linking over 8 hours of nightly sleep with a greater risk of mortality (yes, that means dying). Other studies show that less than six hours, night after night, are linked to greater mortality. But we’re all different and a new book on sleep (which I’ll review in my next post) argues that our sleep-need is genetic and urges us to ignore daft headlines which suggest we may die if we sleep for more than eight hours. Social media and digital stuff also has a sweet spot, although it’s likely to be different for each of us. New research suggests digital distraction (scrolling through social media or simply being in the presence of a screen – even a teeny weeny one) is affecting our ability to concentrate, empathise, and enjoy life. We’re expecting a deluge of research on this subject, so watch this space. 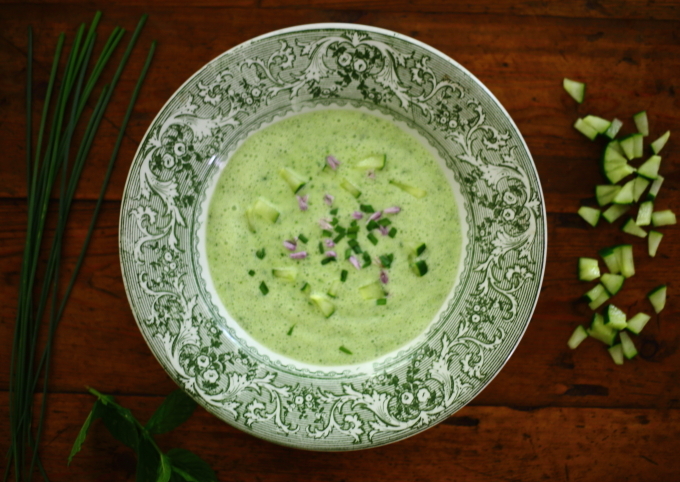 There’s still enough warmth in the air (in the UK at any rate) to enjoy a cool summery bowl of cucumber soup. We ate this a lot over the summer – easy, quick and delicious. Put everything in the blender, blend until smooth, adding more water if you need it. Add plenty of fresh pepper, a swirl of olive oil then top with small cubes of cucumber and as many of the following herbs as you have: basil, mint, fennel fronds, chives and/or chive flowers, parsley. You need fresh flavoursome cucumbers for this. Farmer’s market or home-grown are ideal if you have them.